Swivel Chute Conveyor offered finds use in linking two handling devices used for conveying materials. Being operated using gravity, these chute conveyors also provide for easy installation and reliable performance involving conveying material between decline floors. Some of its features include allowing inexpensive handling of operations, making use of gravity for guiding material flow into bin area, system featuring sturdy constructed intake section, expansion section, floor braces and outlet door support sections that provide for even performance, choice of sprinkler heads installation at top of chute system and along chute riser as demanded by the customers. Established in the year 2009, we, Ready Mix Construction Machinery Pvt. Ltd., are a developing business entity that is eager to carve a strong niche for our selves in the competitive markets of silo accessories and conveyors productions. 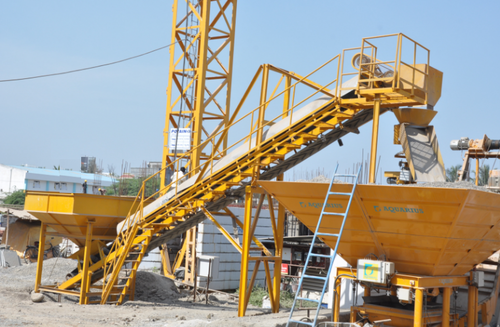 We are leading manufacturing and trading of equipment for concrete batching plant. Our expertise of the market pulse-reading and understanding qualitative values has helped us win a solidified customer-base largely spread in whole country. As a part and parcel of our company's policies, we are bound to provide our customers with only those products that are test-passed on the terms of quality, industrial standards, perfection and approved patterns. We are a team of qualified, committed and experienced Engineers with more than 15 years of experience in the field. We offer our services from Technical assistance for selection of equipment, site lay outing, competitive pricing, foundation marking, optimized deliveries, safe transportation, supervision of erection & service backup till the life of equipment under the brand name RMX. We are also leading service provider of Concrete Plant Layout Consultancy Service and Concrete Plants AMC Service.